In a baking dish, toss the chicken with ½ a teaspoon of oil and oregano. Cover with foil. Cook for 20 - 30 minutes until chicken is cooked through. Add the tomatoes, 1 tsp oil into a medium pot over medium heat. Add the garlic and cook for about 1 minute. Add the chilli flakes and bring to a simmer. Cook for a further 8 - 10 minutes until sauce thickens. 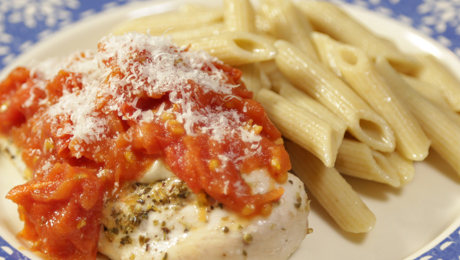 Place chicken on a plate, top with mozzarella and place tomato mixture on top. Put the parmesan on top.